On Monday this week I had the task of creating the new shelf end signs for all of the moved stock, both the books upstairs, and all the journals downstairs. Sorting out the 360s signs was very straightforward and easy to get on with. Sorting out the journals signs was more difficult, as I had to decipher what subject areas we now had and where (and if we had them anymore at all!). Some of the aisles now cover so much material that there were too many subject headings to fit on each sign, so a lot of jiggling around with words and format had to be done. Once the document was ready, it was a matter of printing them out and laminating each one – a very time-consuming process! And then sticking them up on the ends of each aisle. I have absolutely no idea how this task took me most of the day, but it did! Tuesday morning was one of those mornings when nothing went to plan. I had intended to finish off the shelf ends that I’d not had time to laminate yesterday, but we were out of laminating pouches so that had to wait. I then took up the opportunity to help the engineering librarian and the health librarian run a session for medical engineers, however they didn’t show up. After waiting for a while just in case they were late because of the bad weather, we trekked around campus trying to find them, but no members of either the engineering nor the health departments knew where they were. Miscommunication at its worst! So, with half the morning gone on starting things but not being able to follow through with them, I decided to get on with working through the box of peace pamphlets I still had sitting on my desk. Unfortunately, another member of staff was already working on the document in the shared network, so I couldn’t do that either (although had I stopped to actually think about it I could’ve just done the work elsewhere and transferred the information when I could access the actual document). Eventually I got on with doing some research around disability for my project instead. In the afternoon, the health librarian gave me a big list of books that needed discarding – about 400 titles that needed pulling off the shelves, suppressing on the catalogue, and packing into boxes to be sent away. I found this relatively fun, and spent all of Tuesday afternoon, a lot of Wednesday, Thursday afternoon and Friday morning doing this – it was a good space-filling task. My favourite find was a book called “Keeping Healthy ‘Down There'”, and it was a picture book. Much hilarity ensued. On Wednesday afternoon I met with Sarah again to discuss where my project is going next. I’ve made a questionnaire for library staff to gauge where we are at generally with regards to knowledge, training, and also get some staff input on the current level of accessibility in the library. Hopefully I’ll be rolling that out this week. It’s all very exciting (and scary). On Thursday morning I had the opportunity to visit the Learner Development Unit (LDU) and speak with a couple of the academic skills advisors there. The LDU offers advice and help to students in the form of workshops, drop-in sessions and intensive one-on-one sessions, as well as through e-mail and phone. However, the first thing you notice about it is it’s obscure location – it is tucked away in the engineering building, and they have seen a drop in footfall since moving there a couple of years ago. Ideally they would like to be part of Learner Support Services (which is made up of the library, disability service, counselling, careers, IT) – we had quite a long discussion about how this would benefit both staff and students, and I know that a lot of the library staff agree that this would make sense, as there is quite a large crossover between study skills and the library. The advisor took me through their report from the last year, which was full of statistics about user demographics and user satisfaction – the percentage of people who felt considerably more confident after having been to the LDU was somewhere around the 90-95% mark. We talked about the type of sessions offered – the different formats and the different subjects, and all in all I was very impressed with them – their work seems really worthwhile, and because it is a self-referral system, the students mainly tend to want to be there and to want to learn. Once I had finished the discards on Friday morning, I spent the afternoon continuing with the peace pamphlets I’d had on my desk for a few weeks to sort through. I managed to get the box finished by the end of the day, which was a nice conclusive end to the work week. It’s a hot Friday afternoon and I’m knackered, so I’m going to write this week’s log now, as I’ve just finished the physical work I’ve been up to all day. In the afternoon, I met up with the distance learning librarian to discuss what she does for distance learners. She took me through the courses that count as distance learning (but there is often confusion over what is or isn’t distance learning, I would’ve thought a University would have managed to figure that out more clearly…), and the types of requests and questions she deals with. I was glad of this meeting, as I still hadn’t been entirely sure of the processes distance learners have to go through to access some of our resources. On Tuesday morning I attended one of the plagiarism group’s meetings (I’d come so close to avoiding this during my time here!). Every new student at the University has to complete a plagiarism avoidance module, but in the past there have been issues with the way it’s been put onto Blackboard (the learning environment thingymajig. I still don’t really understand it because we didn’t have anything like it when I was a student at Warwick! ), so the group have been coming up with a better way of redoing the process. It all sounds rather complicated to me, but from what I understand, a solution has been found. On Wednesday morning was the ASG (academic support/services (?!) group (subject librarians)) meeting, as per every fortnight. Nothing massively exciting to report there – there was more talk of the plagiarism test, and also a discussion on how/when best to let school/college groups use the library. On Thursday morning I attended the postponed SAPC meeting (School Academic Programmes Committee) for the School of Computing, Informatics and Media. Granted, I didn’t really have a clue what they were talking about for large chunks of it, but it’s really interesting to experience behind the scenes of how University departments operate – as a student, I had had absolutely no clue what went on, and it’s something I’ll learn a lot more about if I eventually become an academic librarian. Other than the above, I have been shifting books for the entire time. All of our 306s were taken into the basement for reclassifying as 360s, and enough stock had been shifted upstairs that it was time to move them back into their correct position in the sequence. It has been a pretty big job to do by myself in a week, but working alone was much better for me in this instance, as I was merging the reclassified books with the pre-existing 360s. Surprisingly, I didn’t find it boring or dull, probably because I’ve been finding ways to amuse myself – mostly through looking at the books (I’ve found two books both titled ‘The Last Taboo’, and each was about something different… this is the kind of simple thing that keeps me entertained!). Another fairly interesting week again last week. Monday. In the morning, I did some work that the Special Collections librarian had sent me the week before – some lists from a small collection elsewhere that I believe is shutting down, asking if we want their stuff. It was a long list of Quaker-related resources, and I had to search our library catalogue for each item, to see if we already had it or not. As we have a lot of peacey resources in our Commonweal collection, and we also have a Quaker collection down in SC, we had probably around 50% of these resources already. In the afternoon, I helped to shift books – I think I mentioned before that the 306s were reclassified last month, now 360s. What I hadn’t stopped to think about previously was that in order for these books to be put back on the shelves in the right place, everything between 307-360 needs to be shuffled forwards about 40 bays. It’s a rather monotonous, laborious task, but it has to be done. I think the most annoying thing about it is that you can be shuffling these books for hours, and it looks like you haven’t done that much, because filling a trolley and then unloading it again only shifts around 5 shelves-worth at a time. But I’ve been appreciating doing some physical movement during the day, as I’m making a big effort to be more active at the moment. And this is definitely active. On Tuesday morning I made some new shelf ends for the 300s that have been shifted to their rightful place so far. I also had a play around with my project questionnaire, because one of the questions isn’t totally accessible to people with screen readers for example, which is ironic given it’s a questionnaire on accessibility. None of the alternative options myself and Sarah had thought about will work, due to the rigidity of the website I’m using, so instead I’m having to put a note at the top of each page saying to contact me if there are any problems and I can provide the questionnaire in a different format. Not ideal, but the best we’ve got. In the afternoon, I was due to attend a School Academic Programmes Committee (SAPC), which is a big departmental meeting which tracks the admin of teaching within the school – or at least so I’m told – once we arrived it was cancelled due to not reaching quorum, and has been rescheduled for this week. I spent some more time shifting books instead. Wednesday was the University’s annual Learning and Teaching conference. There were lots of different sessions throughout the day – I went to sessions on engaging the anxious student, improving English acquisition through social engagement, and a workshop on student engagement. All of them covered some interesting things, and I picked up random facts and figures throughout the day (did you know that 15% of 19-24 year olds suffer significant anxiety?). There was a keynote speech given by Aaron Porter, former NUS President who I hold quite a large grudge against for failing the student movement in the face of trebling tuition fees and who now charges over one hundred pounds an hour as an ‘education consultant’ (whut?! I don’t even…). Despite my personal opinion on him, I still managed to learn some things from his speech, although it was less of a talk containing any of his ideas and inspiration, and more of a relaying of 35 graphs that he’d pulled from somewhere. The part of the day that stuck out the most for me was a series of PechaKucha presentations – this is when you have a set number of slides, each lasting 20 seconds and then automatically moving on to the next one. Topics covered included a student physiotherapy clinic, team-based learning, and encouraging collaboration across schools. On Thursday morning I was back with Acquisitions, where I spent the morning bib-record checking new books. It took a lot of self-restraint for me to not just sit and read one of them, as it was written by a woman known for being a TERF (trans-exclusionary radical feminist). They say you should know your enemy. In the afternoon, and for the whole of Friday, I was shifting books in the 300s. I’ll be doing a lot more of that again this week! Hello all, last week was rather good, as predicted. Monday and Tuesday were relatively normal. Having reached a point the week before where I’d pretty much run out of tasks to do, I’ve been given another big box of peace pamphlets from Special Collections to sort through and take down details of. I spent both afternoons doing this, and am probably around halfway through the box. They’re all old Commonweal stock, mostly donations, but I don’t think they ever made it onto the shelf – fairly sure they’ve been sitting around in boxes for a very long time. Anywho, this particular box is mostly pamphlets about pacifism and anti H-bomb etc. etc. I haven’t stumbled upon anything that massively sticks out yet, but if I do I’ll be sure to take note! In the mornings on Monday and Tuesday (no idea why I started talking about the afternoons first!) I was down in the basement taking notes on which journals have been moved into our rolling stack – these are journals that we have insecure electronic access to, so we’re holding onto instead of chucking them out. We’re going to keep the rolling stack locked, because in the year or two that it’s been accessible for students to use, they have managed to do a fair amount of damage to it. So I was writing down the title, dates and bay of each journal, and then transferring onto a spreadsheet when I got upstairs. I made very slow progress with this on Monday, so on Tuesday I used an iPad spreadsheet app to note it all down, and then just needed to e-mail it to myself and copy and paste into Excel. This was a lot quicker than handwriting it all and then typing it up afterwards! On Wednesday I was up at our Management library for the day to help with the journal discards at their end. The entire day was spent pulling the doomed journals from the shelves, suppressing them on the system and then dumping them in crates to be taken to the skip by porters. Between two of us, we managed to get through all of the management journals by the end of the day (just!! ), with only a short list of law journals leftover to do the following day. I found the whole day quite fun – it was nice to have a change of atmosphere, and the management library was so incredibly laid-back and quiet – we only had half a shelf of returned books in the entire day! On Thursday morning I had my time with acquisitions (who had completely forgotten that I spend time with them every week and had no idea why I was walking into their office). I spent the morning bib-record checking new books, as they had quite a pile up, presumably from having been spending a lot of time reclassifying the 306s. In the afternoon, well, what a treat! I went to Manchester with the graduate trainees from Leeds and Leeds Met. 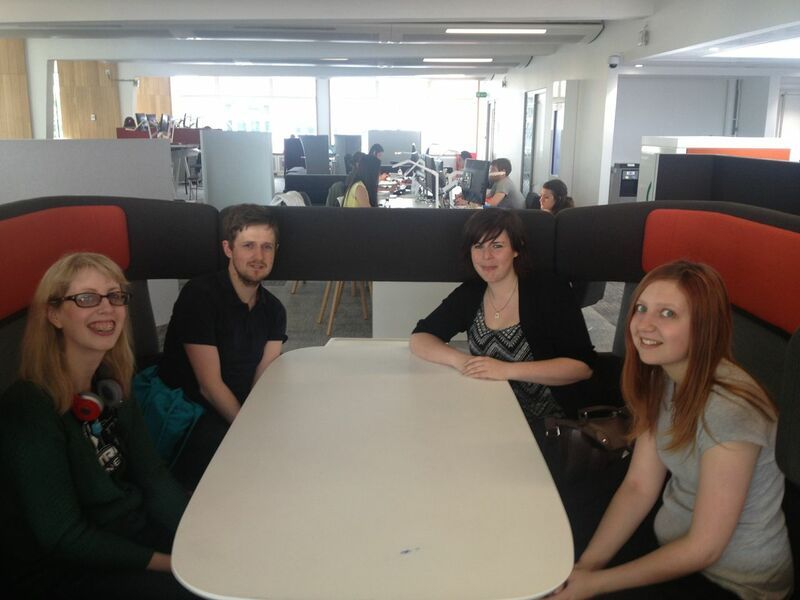 Penny, knowing pretty much every librarian in the world ever, had kindly arranged for the 4 of us to visit Manchester University’s Alan Gilbert Learning Commons. The whole building was stunning. It is such a shiny new building that it was only opened in October 2012, and cost £24m to build. A library building with absolutely no books or journals, it could well be the future of our university libraries. The entire building dedicates all 5 of its huge floors to study space – boasting 1000 study spaces, with 400 PCs, 30 bookable group study rooms, and group study spaces everywhere you looked. At the beginning of our tour we were told to try out any chairs that we wanted to sit in. We all laughed when our guide said that, but along the tour we really did get excited at taking it in turns to sit in each different type of seat – there were so many, and each one more comfortable than the next! There were sofas, armchairs, padded chairs with wide arms to rest your study materials, PODS!, tall chairs, short chairs, pretty chairs… I did think at one point that we were walking around the McDonalds of the library world because of all the colours and shapes, and the particular bench we were trying out looked exactly like somewhere you would sit to eat in a Maccy D’s. My word, the building was gorgeous. There were pictures and quotes about Manchester written and drawn by students printed on the walls and glass panels, which looked really cool. There are a lot of big windows both to let the light in and to let students look outside – there are actually glass boxes sticking out of the building that students can sit on chairs in and just look out around them ‘to be inspired’. It really was quite something. The group study rooms were extremely well equipped, catering for between 2 and 12 students each, all with interactive screens built into the walls complete with a camera in the wall for Skype and conference calls! I couldn’t believe my eyes! The technology in the place really was great for students – these big screens with cameras could also be found in sofa areas elsewhere in the building – and all the sofas had ample plugs fitted into them, too. On the ground floor there were even charging lockers, where you could leave your technology locked up charging. And all of the signs around the building were touch-screen interactive maps, letting you view floor plans, maps of the city, availability of group study rooms and you could even read the news! In ways, the building could just be seen as a giant common room. We discussed this with our guide, who told us that for this reason they have to do very regular patrols to make sure that the space is being used correctly. In term time, the night guards are constantly waking students up – not surprising given the number of places you could stretch out! In the months that they’ve been open, there has only been 1 piece of graffiti found, which is someone’s name written on the inside of a pod-type space. I imagine if Bradford students were let loose in such a space, that would be the last of our worries. I’m sure there was a lot more I had wanted to say about the building, but nothing I write in a blog will compare to actually walking around the place – our tour took over an hour, and we definitely could have spent much longer looking around. The experience certainly made me realise that universities like Manchester are in a *totally* different league to Bradford – the study space in our beloved J. B. Priestley Library has absolutely nothing on the Learning Commons. Granted, the Learning Commons didn’t have physical resources, but the main library is literally about 20 metres away across a path, so students barely have any distance at all between the two. The whole tour was certainly an eye-opener and a great experience, and I’d highly recommend to anyone to go and see how Manchester have used this space. Photos of the building can be found in Manchester University Library’s flickr folder. And that leaves me with Friday. I had a day’s leave. It was grand. I cannot believe it is the 1st July already – this means I’ve been in my job for 8 months today, and I have under 3 months left. I’ll be sad to leave because I love it here and I’ve really settled in, but 8 months is a long time for me to stay in one place, so I’m looking forward to the change. From what I can remember, last week was pretty much entirely filled with the journal discard. My back was doing better than it had been the week before so I was able to help whack everything into the skip again, which is what I spent the bulk of the week doing. If I wasn’t on skip duty, I was helping take down shelves ready to re-arrange the journal floor, or shifting around the journals we’re keeping. Again, these tasks were good fun because I got to see more of people that I don’t normally work with, because a good range of staff members got their hands stuck in. Not a lot else to say on that! I did spend some more time working on my project on accessibility within the library for disabled users – I spent a morning fiddling around trying to put it on our survey programme-type thing that the University pays for, BOS (Bristol Online Surveys). This took a surprisingly long amount of time because I needed to work out how to use the site, and how to format the questions. There was a lot of rearranging and a bit of swearing when I thought I’d finished it and then realised there was the option to create different pages but no option to shift questions across them, so I had to delete a lot of it and start again! Oops! On Wednesday morning I attended a staff training session on Endnote X7. It was fairly confusing for me because I’ve never used Endnote desktop before, and the session focused on changes between the new and the old version, as opposed to how to use it, but I could at least now tell you about uploading and organising PDFs! Thursday morning was my time with acquisitions, and it was yet more journal-related shenanigans. I was re-labelling the journals in our Development Collection with their Dewey number, ready to be moved in with the main journal collection downstairs, because they’ve been weeded to such an extent that there isn’t really much point keeping them in a separate place anymore! The shelves did look very sad. It is the end of a bit of a hectic week here at JB Priestley Library. The ongoing task has been journal discards – of which we have 1.5km of them to put in a skip (out of around 3km, so basically we’re halving our print journal collection). It’s been nice because everyone’s been chipping in on and off during the week, so I’ve seen a bit more of some people I don’t bump into very often. The system we’ve got going on leaves a lot to be desired, mainly due to the awkward positioning of the skip and an inconvenient loading bay. We have had one person on the journals floor pulling the doomed journals off of the shelves and putting them in big cages. Full cages get pushed to the loading bay at the back of the building. Unfortunately, there is no easy way of getting the journals down from the loading bay, which is a large platform with no lift or ramp for lowering things, as usually vans would just back onto it. This means that we need to have one person up with the cages unloading them, passing journals down to people on the ground who then put them in big boxes on a trolley, which is then wheeled *up a hill* to the skip, which is in the car park. From here, the boxes need to be unloaded from the trolley and into the skip (it is a walk-in skip), and people then unload the journals from the boxes and stack them as high up and compacted as possible. I think this is one of those things that would be classed as a ‘logistical nightmare’. It is now the end of the week and we’re halfway through, having filled two entire skips. It’s hot, sweaty and backbreaking work (yeah, um, I hurt my back whilst in the skip yesterday afternoon and haven’t been able to help today… oops! ), but I think it’s quite satisfying to watch the progress as the skip fills up. 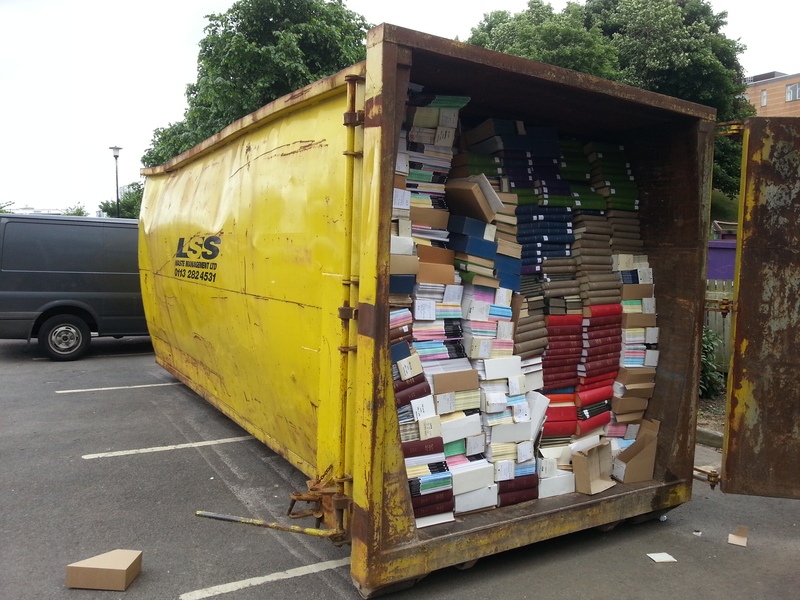 And only once have we thrown away the wrong half of a very large run of journals… (!) but we managed to dig most of them back out. On Tuesday morning I helped the Health Studies librarian with another of her sessions, I’m definitely confident using Cinahl now after having seen it demonstrated a few times. In the second half of the morning the group then went to a computer cluster and a lot of the students needed quite a lot of individual help with searching for their topics. The trickiest part wasn’t navigating the database so much as using medical terms – coming up with synonyms and related words to terms I wasn’t overly familiar with was challenging, but we got there eventually. Also on Tuesday I attended a session on copyright and licensing run by two library staff members, aimed at academics. Whilst it wasn’t the most enthralling topic in the world, I had pretty much zero knowledge on this area other than the usual journal/book photocopying rules, so I did learn about the different types of license that the University has, how different rules apply to different items, and about Creative Commons, so I definitely got something out of it. The other tasks I’ve been doing between bursts of journal moving have involved various spreadsheets and catalogue searches. One of my tasks was to go through the list of journals held at our Management library and list if/where we have access to them online and the dates. I found a lot of broken links or incorrect dates given, so I’ve got a nice long list of items to send to the folks responsible for ejournals at some point. The next task was to search the library catalogue for books listed on the reading lists of a new academic coming to teach archaeology at the University – certainly the longest reading lists I’ve ever seen, and this took longer than I had been expecting! The final task was to search Ebscohost Business Source Complete for a big range of ‘Country profiles’ and ‘Country reports’ that we think may be listed incorrectly on our catalogue (I think we’re hoping to get rid of the print holdings!). So after this week, I’ve got Ebscohost coming out of my ears! All in all a fun week, actually. Another week spent measuring journals on shelves. I finally finished them all, huzzah. ^ I would love to leave this post just as that, but I suppose I should elaborate a bit more on the week! So I finished measuring (this took up the bulk of my week again), and also did some more measurements of the space itself, and put some more figures on some shiny floor plans I’d made so that Sarah could do some number crunching. We’re hoping (Dear God I hope my measurements are correct!!) that we should actually be able to fiddle with the shelving and actually make the floor fully accessible to wheelchair users and the lot – that is, if we really have got 3km of journals down to 1.5km. It’s gonna be close. Other things I did last week… on Monday afternoon I started my new career as a model. Some of the librarians are making a couple of new tutorials for the website, on finding a book and using the photocopiers, and they needed someone student-looking, so naturally I was first port of call. I felt a bit stupid, but at least now I’ll live on once I’ve left the library! On Tuesday and Friday I spent more time planning the questionnaires for my project on library accessibility. I had meetings with two other members of staff to discuss what to include and how to include it, and I’ll be meeting with another librarian tomorrow to work on how best to word the questions to get the best possible responses. I have one questionnaire for disabled students and one for library staff members, and I think they’re looking quite good so far. On Thursday morning I did a task that I’d forgotten to do whilst measuring – labelling some boxes of journals as not to be discarded without first consulting Special Collections – when, an hour into the morning, I realised I was supposed to be with acquisitions. Oops! All was good though, and I spent the morning with them spine labelling – at the moment they’re reclassifying all of the 306s, so there’s shelves and shelves and shelves to be done. Friday was spent finding some resources that might be useful for my project, but most of the day was spent working on a spreadsheet I’ve been given to complete – it is a list of all of the journals held at our management library, and I am looking each one up on the catalogue and noting down ISSN, classmark, and if we have online access. I have so far got through 100 titles out of over 300, so I’ll be doing this for a while longer yet! I don’t have very much at all to say about last week. All of Monday, Tuesday and Friday were spent down in the basement measuring journals. I’m hoping to have that all finished by the end of this week. Maybe. I think that the plan is to start getting rid of the journals we’ve decided to get rid of next week, and two weeks later it should be finished and all will be skipped and shifted and tidy. That’s the plan, anyway. Wednesday morning was our fortnightly ASG meeting. I think the most surprising thing that happened in this meeting was that it finished on time! Afterwards, I headed back down to the basement (it’s almost as if some kind of gravitational force pulls me down there at any spare moment…), but this time accompanied by Sarah, to do some measuring of a different kind – the widths and lengths of each aisle. We’re going to have to cut the space down even further to fit an OPAC and printer down there, but the most hideously obvious thing about this floor is how incredibly inaccessible it is even to able-bodied people – so people in wheelchairs don’t stand a chance. The absolute minimum aisle width we’re supposed to be allowed is 1.2m. Most of the aisles down there average somewhere around 0.8m, and we have some as small as 0.46m, which Sarah can’t even stand straight in, and she’s a small lady! In an ideal world we would take out every other aisle, but that would mean halving what is left of our already weeded and weeded and weeded print journals, which just isn’t doable. Instead, we’re hoping that maybe we can take out a bay from the middle of each aisle to double the size of the aisle that goes across the middle of them. I’m still working out the figures for all of this (you’d be surprised how many different answers I’ve been able to come up with just from adding up the same set of figures over and over again…), but it’s gonna be tight. Real tight. Literally. Thursday morning I attended a workshop on finding community statistics online, which was open to people doing work in the Bradford community, and also to library staff. The biggest thing I took away from this session was how to access census statistics online – totally didn’t know you could do that! The man leading the workshop showed us how to do various different searches to find different things, but I think the best way of getting to grips with it is just to have a play around and see what you come up with. I found it extremely interesting to compare figures from my local neighbourhood in Bradford with others (turns out my area is about the most deprived – I’m not remotely surprised), and also comparing my neighbourhood with my home ground back in Essex (a primarily white, Christian and ‘comfortable’ neighbourhood in terms of work and education). Thursday afternoon I attended the last meeting about deciding which journals to keep and which to discard – the second half of the 600s, that hadn’t been reached in the previous meeting. Again, I found it very interesting to follow and agree with the librarians’ lines of thought. There were a couple of awkward moments and minor disagreements, but still no blood on the carpet as I had been promised. Which is a shame, cause we could really do with a new carpet on this floor. My week was rounded off with more measuring – Friday was my biggest marathon so far, and I would’ve got the whole spreadsheet I was working on done in the one day if it hadn’t been for those pesky kids! Translation: I was going really well until I reached our rolling stack, which students had somehow managed to break shelves in, and someone had put all of the stock from these shelves randomly around the whole rolling stack – lying over the top or slotted into random places – so it took me over an hour to sort the whole mess out before I could actually do any measuring there. It was the end of the day and I was very disappointed! I’m going to be away on leave next week (the first leave I’ve booked in the 7 months I’ve been here… oops! ), so I’m writing this log on a Friday afternoon again while everything is still fresh. On Monday and Tuesday I spent a lot of time continuing my work from the week before, measuring the shelf space of the journals with classmarks in the 300s. I managed to get this done in two large chunks of time on each day. Not a lot else to add to that, really! I also spent some time on both days beginning to think about and look into my graduate trainee project as opposed to just having an idea stapled to a big fluffy cloud up in my head somewhere. So, my project. I am going to be doing this on improving library access for disabled users. Obviously this is a massive task that covers a lot of different things, because there are a huge number of types of disability, including physical, mental and learning disabilities. When I sat down and thought about things I wanted to change/do/improve/implement, I thought that perhaps I’d bitten off more than I could chew, but I shall start with my research and see where to go from there. Any improvement is better than no improvement (and our library really needs improvements!). On Tuesday I had a meeting with my line manager and our member of staff who is responsible for helping disabled users, and on Wednesday I had a meeting with my line manager, the Special Collections librarian, head of library services and head of disability service. I didn’t say too much in that meeting because I’m terribly anxious in such situations and never manage to spit out what I want to say, but everyone else seemed happy enough to talk while I nodded and agreed! The plan at the moment is for me to talk to as many disabled students as possible about their experience of the library, any barriers, anything they’d like to see change. I’ll also be talking with academic staff members as well as the subject librarians, and basically anyone that can contribute to gauging where the library is currently at with access, to establish where we need to be. I’m aiming to do a fairly thorough review of the library, and hopefully come up with a service level agreement and some improvements that we can start to put in place. If I’m feeling particularly optimistic, I’d also like to work towards changes in staff training and the marketing of our services for disabled users. So that’s pretty much where I’m at at the moment. Obviously you’ll be hearing a lot more about this later on. On Wednesday morning I attending an ‘introduction to acquisitions’ session for ASG. This involved a lady from acquisitions giving a short presentation about what it is that they do (most of this I was already aware of). It was amusing, as always, when she showed a graph produced by Millennium and a link out of it to somewhere else, and the subject librarians got angry about not having access to the program 🙂 I am in full agreement that it is ridiculous that the librarians do not have access to the library management system (especially when they give random n00bs like me an account! ), but it never ceases to tickle me when librarians get a little heated. On Thursday morning I attended a staff workshop on a project called ‘Changing the Learning Landscape‘ that the University is taking part in. I’ll be honest, I wasn’t entirely switched on this early in the morning and I didn’t really have a clue what the presenter was talking about, although after having talked to some of my colleagues down in customer services afterwards, it appears I’m not the only one. I think basically the idea is to improve learning and teaching through an increased use in technology based on the concept that young people are getting more and more techy, but I wouldn’t quote me on that! I spent the rest of the morning in acquisitions. This week my task was to create authority records on the catalogue for around a hundred theses that had recently been added to the system. I finished this early, and as most of the acquisitions staff were elsewhere in the building doing some training, I headed back to my office to finish sorting through my last box of peace pamphlets for Special Collections. In the afternoon I put together a flyer/leaflet about library access for graduates, as we had nothing on this and it is a question that has been coming up fairly regularly. The librarian in charge of our pop-up library had asked me to create it and I had fun. I have to eat my own words from last week though, as I had to use the template that had been the subject of intense debate in last week’s ASG meeting! On Friday morning (today! ), I attended a meeting re:print journals, where the subject librarians responsible for the 500s discussed which titles they were going to keep, and which they were going to discard (or a mixture of the two). I had been promised I’d get to witness blood on the carpet at this, but alas, there was none. Thoroughly disappointing. Jokes aside, I did find it very interesting to see the thought process behind each decision, and I even started to understand my line manager’s giant spreadsheet (she really, really loves spreadsheets). After the journals meeting, I teamed up with a colleague to do the last Library on Location (pop-up library) of term. There is a big end-of-year party going on in the student union, so we set up camp there with a lady from careers from an hour and bombarded finalists with the flyer I made yesterday. When I say bombarded, what I actually mean is handed a limited number out, as most of the students weren’t in their final year yet, and people hadn’t come to the party to talk about the library! I took off my badge and lanyard for a few minutes to pretend to be a student and claim free sweets and ice cream. Well worth it! And that’s it for this week. I will be spending the rest of the day at the enquiry desk, inputting my measurements from the 300s journals into a spreadsheet. Have a nice week. Since it’s the end of the day and it’s dead quiet at the enquiry desk, I shall attempt to write this week’s log now, as opposed to by Monday, when I will have forgotten everything, like I normally do. I’ve spent a lot of my time this week having a love affair with a tape measure – measuring the amount of space each journal is taking up on the shelves. This may sound like an odd thing to do, but it makes sense, honest! With last year’s refurbishment, the librarians had to throw away an awful lot of print journals to fit them all into the designated space. We’re soon going to be losing a big chunk of that space because it actually belongs to ICT services and they want it back, so we now have to squeeze all of the journals onto just one floor instead of two. This means that the librarians are having to make yet more decisions about journals to throw away (largely based on age, usage, and whether or not we have secure online access). So my job is to measure the amount of space that each journal they decide to keep takes up, so that eventually we will know if everything is going to fit. I have spent many hours doing this this week, and have many more to come (I’ve so far measured the 00s, 100s, 200s, 400s, 800s and 900s – our shorter runs. I’m now on the 300s which consists of around 700 individual titles, and the 600s will probably take me until the end of my life). I’ve actually found this task rather enjoyable because I’m still recovering from being unwell so it’s nice to have an easy task to get on with in a quiet space. On Tuesday I met up with 2 of my colleagues in the international group to discuss making an online library induction specifically for international students. Some people are having training on Camtasia, and none of us really know what it does, so we think that using the program to make this tutorial will be a good opportunity to learn how to use it. Things we discussed including include talking about the differences between a British university library and international ones (I’m not entirely sure how this will work given the number of different locations are students are from), an introduction to the library and subject librarians, an introduction to our library language booklet/pages, and signposting to other university services. We’ll be meeting again at some point in the future to work on this further. Wednesday morning was the fortnightly ASG meeting (Academic Support Group/subject librarians, since I’ve not elaborated in a long time). I’m unsure if I’m perhaps a bit close-minded, but I was in a state of shock when they managed to talk about the header on the template for documents that the library produces for almost an hour! An hour! Talking about a header! I won’t go into the discussion because it’s quite hard to describe without having the template in front of you – I understood what the librarians were saying, but it didn’t seem like anyone was listening to the lady there who sorts these things out (I’m unsure of her job titles so that’ll have to do!). The rest of the meeting was then rather rushed, and for what? An unresolved discussion about a document header that, as far as I could tell, didn’t have much wrong with it in the first place! As I say, I’m probably more apathetic as I don’t have to produce any documents using it myself, but I did think certain members were a little over-dramatic and expecting miracles. Later on Wednesday I helped with Library on Location – a pop-up stand and info that we take to various different places around the university so that people can ask questions and give feedback. This week we went to the language/international centre, as it had previously been very successful there. One person came in the hour, with a complicated problem with library fines, so ultimately we had to put him in contact with the head of customer services. On Thursday morning I had my weekly time in acquisitions. For the first hour or so I was activating links for newly-purchased ebooks. I was then given some new DVDs to catalogue. I found this much more difficult than cataloguing books, as different DVDs have different types and amounts of information on them. It was taking me around twenty minutes per DVD, whereas a book would only take me a few minutes. I’ve not had any feedback on the records that I got through, but they looked pretty comprehensive from where I was sitting. The other main thing I’ve done this week is spend some time with the Health Studies librarian. The health studies collection used to be in a separate building but was brought into the main library a couple of years ago. I met up with the librarian to talk about the differences between health studies students, enquiries and databases compared with our other students – and it’s certainly more complicated than I had been expecting! I learnt a lot about the courses they do and the type of assignments and research they have to undertake – it’s all far less straightforward than a regular assignment for other students – these guys change policy in hospitals and stuff! I also attended two library induction sessions for two groups attending courses that have just started for people already in the nursing profession but wanting specific qualifications – one was focused on haematology, the other on, well, I can’t remember because it was some medical term I didn’t know, but the session was focused on cervical screening. It was interesting to attend these sessions and see how they differ depending on what the students want/need from them. They started out very basic – catalogue searches – and ended with being taught how to do more in-depth searches on CINAHL, a nursing database. I was fairly unfamiliar with this database, but after having had it demonstrated to me 3 times in 24 hours, I can fairly confidently say I’d be able to help a student now. The second of the sessions took place in a computer room so the students were able get some hands-on experience playing around, and I feel I helped quite a lot both with their searches and also with log-in and password problems, thanks to my customer services training that the health studies librarian didn’t have. The first session was particularly amusing because the librarian explained what EndNote was and the students, who had never heard of such a thing, were absolutely ecstatic about it and asked for further detail on how to use it. One of the students described it as being “like Christmas”!! Very entertaining. The other task I’ve done this week, also for the Health Studies librarian, is look on all of the online Health Studies reading lists for a specific book on counselling, that has been brought to our attention as rather homophobic by a student (being gay is a disorder, apparently). Naturally we want to take it out of circulation, but because it’s been borrowed so much we need to make course tutors who specify it on reading lists aware of the problem first. Unfortunately, after searching the long list of lists 3 times, I couldn’t find it anywhere, so I’m not really sure where we go from here. We shall see. So that’s my week. It’s been full of interesting things separated by calm time in the basement amongst the journals. Pretty good, really. 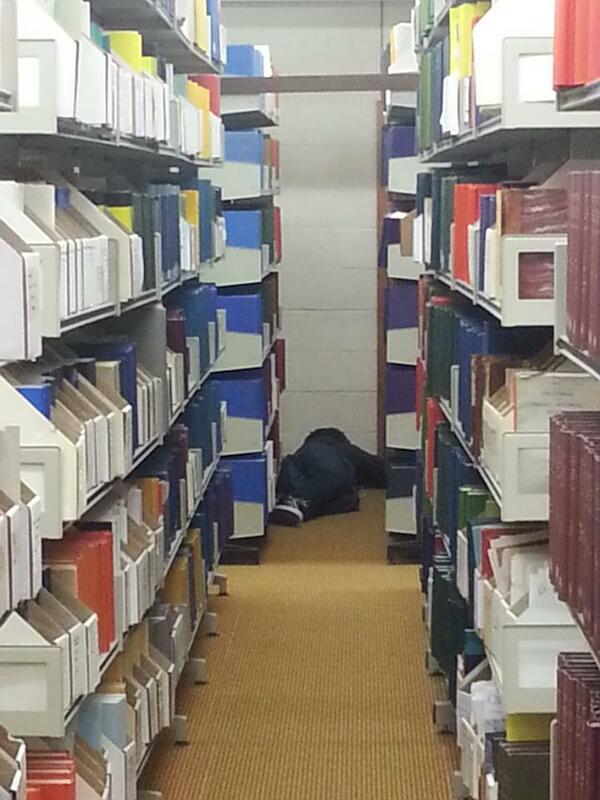 A student I found sleeping amongst the journals. At first I thought he might have been murdered, but then he started snoring.